The present protocol describes the usefulness of multiple fluorescence in situ hybridization (mFISH) and spectral karyotyping (SKY) in identifying inter-chromosomal stable aberrations in the bone marrow cells of mice after exposure to total body irradiation. Pathak, R., Koturbash, I., Hauer-Jensen, M. Detection of Inter-chromosomal Stable Aberrations by Multiple Fluorescence In Situ Hybridization (mFISH) and Spectral Karyotyping (SKY) in Irradiated Mice. J. Vis. Exp. (119), e55162, doi:10.3791/55162 (2017). Ionizing radiation (IR) induces numerous stable and unstable chromosomal aberrations. Unstable aberrations, where chromosome morphology is substantially compromised, can easily be identified by conventional chromosome staining techniques. However, detection of stable aberrations, which involve exchange or translocation of genetic materials without considerable modification in the chromosome morphology, requires sophisticated chromosome painting techniques that rely on in situ hybridization of fluorescently labeled DNA probes, a chromosome painting technique popularly known as fluorescence in situ hybridization (FISH). FISH probes can be specific for whole chromosome/s or precise sub-region on chromosome/s. The method not only allows visualization of stable aberrations, but it can also allow detection of the chromosome/s or specific DNA sequence/s involved in a particular aberration formation. A variety of chromosome painting techniques are available in cytogenetics; here two highly sensitive methods, multiple fluorescence in situ hybridization (mFISH) and spectral karyotyping (SKY), are discussed to identify inter-chromosomal stable aberrations that form in the bone marrow cells of mice after exposure to total body irradiation. Although both techniques rely on fluorescent labeled DNA probes, the method of detection and the process of image acquisition of the fluorescent signals are different. These two techniques have been used in various research areas, such as radiation biology, cancer cytogenetics, retrospective radiation biodosimetry, clinical cytogenetics, evolutionary cytogenetics, and comparative cytogenetics. The two most reliable methods of identifying radiation-induced inter-chromosomal stable aberrations are multiple fluorescence in situ hybridization (mFISH), which allows the painting of two or more chromosomes simultaneously, and spectral karyotyping (SKY), which imparts a distinct color to each homologous chromosome pair in the genome. Unlike unstable aberrations, stable aberrations are persistent in nature and may be propagated for several generations in irradiated populations1, and are regarded as critical molecular "signatures" of radiation-induced cytogenetic lesions2. Studies by various groups have shown that stable aberrations are associated with the pathogenesis and development of a number of diseases, including cancer3. Before the era of chromosome painting (also referred as molecular cytogenetics), the conventional G-banding technique was the only method for detecting stable chromosomal aberrations. However, chromosome banding is a challenge to cytogeneticists because the resolution is limited, reproducibility is uncertain, it is a labor-intensive procedure, and it requires highly skilled and experienced cytogeneticists for reliable data interpretation4. Moreover, the classic banding technique does not allow detection of complex chromosomal rearrangements, which involve the interaction of three or more breaks distributed among two or more chromosomes, a common outcome of radiation damage. Complex aberrations may persist in individuals many years after radiation exposure, making them useful for retrospective biodosimetry5. Therefore, an alternate approach was required to overcome the limitations of conventional banding techniques to detect stable chromosomal rearrangements. In the late 1960s, the pioneering work of Gall and Pardue (1969) on molecular hybridization using nucleic acid probes labeled with radioactive material commenced a new era in the field of cytogenetics, which allowed detection of a specific DNA sequence on chromosomes6. However, the use of radioactive probes for molecular hybridization had several drawbacks: radioactive probes are relatively unstable, probe activity depends on radioactive decay of the isotope used, hybridization takes a longer time, the resolution is limited, the probes are relatively costly, and the radioactive materials are a health hazardous. Thus, it became necessary to develop and design non-radioactive probes. The introduction of fluorescent tagged nucleic acid probes in the 1980s and 1990s overcame the limitations of radioactive probes and greatly enhanced the safety, sensitivity, and specificity of the hybridization technique7-10. Fluorescent probes give rise to extremely bright signals when observed under fluorescence microscopes equipped with the appropriate excitation and emission filters. Any loss, gain, or rearrangement of fluorescent labeled chromosome/s or a part of the chromosome is easily identifiable with this FISH technique. Analysis of chromosomal aberrations by FISH painting has led to marked progress in cytogenetic research over the years. Designing fluorescent labeled probes for specific applications ranging from locus-specific probes to whole-chromosome painting probes has advanced the field significantly; this has also facilitated the detection of submicroscopic ("cryptic") rearrangement, which was not possible by conventional chromosome banding. Chromosome painting by mFISH and SKY have proven to be valuable tools for the identification of simple and complex inter-chromosomal rearrangements. The basic principles for both techniques are similar, but the method of detection and discrimination of fluorescent signal after in situ hybridization and the process of image acquisition are different. In mFISH, separate images of each of the four fluorochromes are captured by using narrow bandpass microscope filters; dedicated software is then used to combine the images. While in SKY, image acquirement is based on a combination of epifluorescence microscopy, charge-coupled device imaging, and Fourier spectroscopy, which allows the measurement of the entire emission spectrum with a single exposure at all image points. 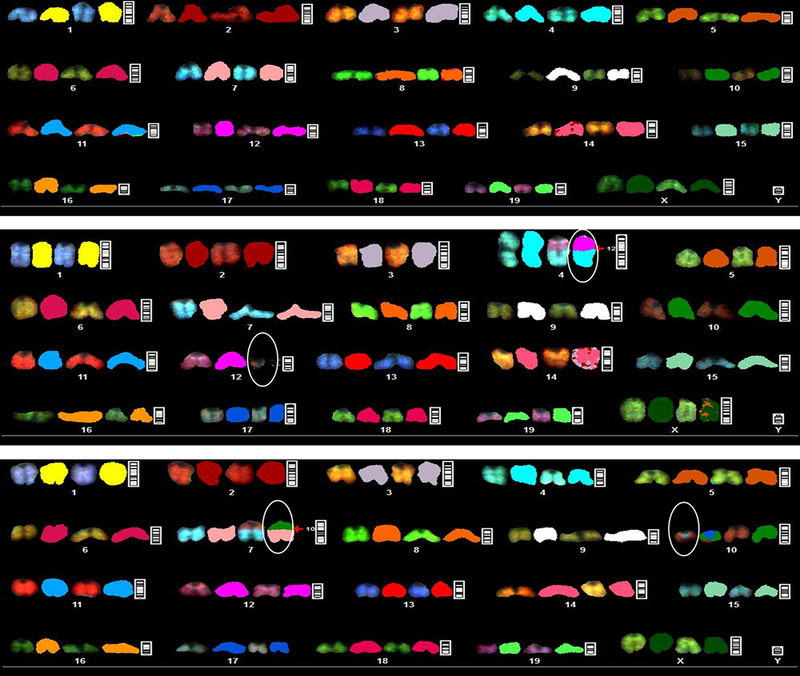 In both mFISH and SKY, monochrome images are captured independently, then merged, and finally, unique pseudo-colors are assigned to the chromosomes in monochromatic images based on the specific dye attached to each fluorochrome probe. The contribution of mFISH and SKY analysis in the radiation biology field is remarkable, particularly for retrospective dose estimation of human exposure to IR (radiation biodosimetry)11-14, radiation carcinogenesis risk assessment15, as well as detection and risk estimation of radiotherapy-related secondary cancer16. A recent study on mice has shown that a FISH-based chromosome painting technique is also an important tool for evaluating the efficacy of radiation countermeasure17. In the present study, the effect of total body radiation exposure on the induction of stable chromosomal aberrations in the bone marrow cells of mice has been demonstrated using mFISH and SKY techniques. All animal studies were carried out in strict accordance with the recommendations in the Guide for the Care and Use of Laboratory Animals of the National Institutes of Health. The animal protocol was approved by the Institutional Animal Care and Use Committee of the University of Arkansas for Medical Sciences. All animals were housed under standard air-conditioned animal facility at 20 ± 2 °C with 10 - 15 hourly cycles of fresh air and free access to standard rodent food and water. Upon arrival, the mice were held in quarantine for 1 week and provided certified rodent chow. Expose un-anesthetized mice to 2 Gy whole-body radiation in an irradiation chamber. During irradiation, place mice in a well-ventilated holding chamber to make sure they do not move freely and receive a uniform dose. Inject 100 µL of 0.05% colchicine solution (colchicine powder dissolved in calcium and magnesium free PBS) intraperitoneally using a 25 G needle attached with 1 mL disposable syringe. Avoid injection directly into any organ. Leave the animal in the cage for 2 h before bone marrow cell harvest. Observe the animal for any signs of pain or distress. Euthanize the mouse by CO2 asphyxiation. Spray 70% ethanol on the dorsal and ventral side. Make a 2 cm incision on the abdominal skin with sharp scissors. Grasp the skin on either side of the incision with blunt tweezers and gently pull open the abdominal muscles. Cut off both the hind legs with scissors and immediately place them in pre-chilled PBS with 4% FBS. Carefully clean all the muscles attached to the hind limb with a sharp razorblade and cotton gauze bandage. Separate the tibia from the femur. Trim both tips of each bone with a razorblade. Flush the contents of the bone marrow with 3 mL PBS (with 4% FBS) using a 23 G needle attached to a 3 mL syringe and collect the content in a 15 mL centrifuge tube. Pass the cell suspension at least 10 times through the needle to make a single cell suspension. Carefully overlay the cell suspension on an equal volume of lymphocyte separation medium (3 mL) without disturbing the interface between the cell suspension and lymphocyte separation medium. Centrifuge at 400 x g for 30 min at room temperature. Collect the buffy coat carefully without disturbing the other layers and transfer in a new 15 mL centrifuge tube. Add 10 mL PBS to the tube containing the buffy coat. Centrifuge at 400 x g for 5 min at room temperature. Carefully remove the supernatant. Then break up the cell pellet with gentle tapping and add 10 mL PBS. Remove the supernatant without disturbing the cell pellet, break up the pellet, and add 4 mL of pre-warmed hypotonic 0.075 M potassium chloride solution. Add hypotonic solution drop by drop with gentle constant shaking. Incubate cells for 20 min at 37 °C in a water bath. After hypotonic treatment, add an equal volume (4 mL) of fixative (methanol: glacial acetic acid, 3:1 v/v) in the 15 mL tube and mix gently by inverting the tube. Centrifuge at 400 x g for 5 min at room temperature and discard the supernatant. Break up the cell pellet with tapping followed by gentle vortex for a few seconds and add 3 mL of fixative solution drop by drop with constant shaking. Incubate for 30 min at room temperature and then centrifuge at 400 x g for 5 min. Remove the supernatant, break up the cell pellet with gentle tapping, and add 3 mL fresh fixative. Centrifuge at 400 x g for 5 min at room temperature, and remove the supernatant. Break up the cell pellet with gentle tapping, and add fresh 3 mL fixative. Repeat step 3.12 twice more. Centrifuge at 400 x g for 5 min at room temperature, and remove supernatant without disturbing the cell pellet. Then add 400 to 600 µL fixative and mix thoroughly with pipetting. Drop 30 µL fixed cells onto pre-cleaned and wet slides tilted at a 45° angle and allow the slides to air dry completely overnight. Place the slide containing metaphase cell spreads in 2x SSC for 2 min at room temperature. Dehydrate the slide by serial ethanol washing for 2 min each in 70%, 80%, and 100%. Incubate for 60 min at 65 °C. Preheat 40 mL denaturation solution (70% formamide/2x SSC; pH 7.0) to 70 °C (± 2 °C) in a glass Coplin jar for 30 min. Denature chromosomes by incubating the slide in pre-warmed denaturation solution for 1 - 1.5 min. Quench slide immediately in ice-cold 70% ethanol for 2 min to stop the denaturation process as well as to prevent the denatured chromosomes from re-annealing. Then dehydrate by washing with 80% ethanol for 2 min. Repeat the ethanol wash with 100% ethanol for 2 min. Completely dry the slide at room temperature. Briefly centrifuge the probe mixture supplied by the manufacturer, transfer 10 µL of probe mixture into a 500 µL snap cap centrifuge tube, and denature by incubation at 80 °C (± 2 °C) in a water bath for 7 min. Place the centrifuge tube with probe mixture in a water bath at 37 °C for 10 min. Apply the denatured probe mixture onto the slide with denatured chromosomes. Carefully cover the area with an 18 mm x 18 mm glass cover slip and eliminate any visible air bubbles by very gently pressing the cover slip to slide. 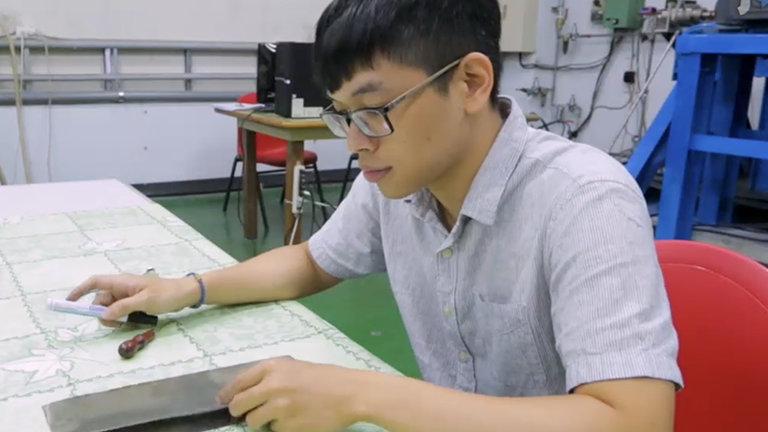 Seal all four sides of the cover slip with rubber cement and incubate for 12 h to 16 h in the dark at 37 °C in a humidified chamber for hybridization. Carefully remove the rubber cement and the cover slip. Place slide in pre-warmed 0.4x SSC at 74 °C (± 2 °C) for 5 min. Wash slide in washing solution II (4x SSC/0.1% Tween-20) for 2 min. Place 20 µL of anti-fade mounting medium with DAPI counterstain (1.5 µg/mL) and cover with a glass coverslip. Press gently on coverslip with lab tissue to remove air bubbles and excess mounting solution. Seal the edges of coverslip with nail polish. View slides using a fluorescent microscope equipped with appropriate filters. Equilibrate slide in 2x SSC at room temperature for 2 min, without shaking. Dehydrate slide in an ethanol series (70%, 80%, and 100% ethanol) for 2 min each at room temperature. Air-dry the slide to remove the ethanol completely. Warm 40 mL denaturation solution (70% formamide/2x SSC; pH 7.0) in a glass Coplin jar for 30 min. Incubate slide in pre-warmed denaturation solution for 1 to 1.5 min. Immediately immerse the slide into ice-cold 70% ethanol for 2 min to stop the denaturation process as well as to prevent the denatured chromosomes from re-annealing. Dehydrate the slide by placing it into 80% ethanol for 2 min and then into 100% ethanol for 2 min at room temperature. Denature the SKY probe (vial #1 supplied by manufacturer) in a water bath set to 80 °C (± 2 °C) for 7 min, and then immediately place into a different water bath set to 37 °C for 10 min. Add 10 µL of denatured SKY probe onto the denatured chromosomes. Carefully place an 18 mm x 18 mm glass coverslip onto the SKY probe so that no air bubbles are trapped under the coverslip. Seal the edges of the coverslip with rubber cement. Place the slide in a humidified lightproof chamber and incubate in the dark at 37 °C for 24 h to 36 h.
Remove rubber cement very carefully without disturbing the coverslip. Place the slide into pre-warmed rapid washing solution (0.4x SSC) at 72 °C (± 2 °C) for 5 min with constant shaking. Immerse slide into washing solution III (4x SSC/0.1% Tween 20) and incubate for 1 min while shaking. Optional: Add 80 µL of blocking reagent (vial #2 supplied by manufacturer) onto the area of hybridization, place a 24 mm x 60 mm plastic coverslip, and incubate in the dark at 37 °C for 30 min in a humidified chamber. Gently remove the plastic coverslip and wash the slide with pre-warmed (45 ºC) washing solution III for 5 min. Apply 80 µL of Cy5 staining reagent (vial #3 supplied by manufacturer), place a 24 mm x 60 mm plastic coverslip, and incubate at 37 °C in the dark for 40 min in a humidified chamber. Dip the slide into a glass Coplin jar containing pre-warmed (45 ºC) washing solution III (4x SSC/0.1% Tween 20) and incubate at 45 °C in a water bath for 2 min with shaking. Repeat this washing step 3 times. Apply 80 µL of Cy5.5 staining reagent (vial #4 supplied by manufacturer), place a 24 mm x 60 mm plastic coverslip, and incubate at 37 °C in the dark for 40 min in a humidified chamber. Wash the slide 3 times with pre-warmed (45 ºC) washing solution III. Hold the slide in a tilted position against a paper towel to drain excess fluid. Add 20 µL anti-fade DAPI reagent (vial #5 supplied by the manufacturer) and carefully place a 24 mm x 60 mm glass coverslip without introducing any air bubbles. Seal the edges of coverslip with nail polish and observe with an epifluorescence microscope equipped for capturing SKY images. Total body irradiation induces numerous chromosomal aberrations in the bone marrow cells of irradiated mice. The current protocol is optimized for in vivo mitotic arrest of bone marrow cells after radiation exposure, harvest of bone marrow cells from the hind legs of irradiated mice, isolation of bone marrow mononuclear cells by density gradient centrifugation, preparation of metaphase cell spreads, and subsequent detection of radiation-induced stable chromosomal aberrations by mFISH and SKY techniques. Chromosome painting using these techniques can be used to detect and assess the risk of various pathophysiological conditions. Figure 1 shows representative metaphase cell spreads with normal and aberrant mouse chromosome pairs-1, -2, and -3. Figure 2 shows spectral karyotyping of normal and abnormal mouse metaphase chromosomes. These results show that ionizing radiation induces inter-chromosomal stable aberrations in the proliferating murine bone marrow cells, which is primarily comprised of stem and progenitor cells that are responsible for self-renewal and differentiation into diverse cell types. Cytogenetic alterations in stem and progenitor cells have been shown to associate with various clinical diseases, including cancer, and are considered to be the strongest predictors for disease severity and overall survival. Therefore, it is logical to infer that ionizing radiation-induced stable inter-chromosomal aberrations may cause increased risk of cancer development. Figure 1: Effect of Radiation on Bone Marrow Cells of an Irradiated Mouse as Detected by mFISH. A and B show a mouse metaphase cell spread with normal pairs of chromosome-1 (red), chromosome-2 (green), and chromosome-3 (aqua). All other chromosomes are counterstained with DAPI (blue). C shows stable aberration involving chromosome-1, a part of chromosome-1 has been integrated in a non-painted (DAPI) chromosome, while another part has formed an acentric fragment. D shows a part of a part of chromosome-2 has been integrated in non-painted chromosome. E represents stable aberration involving chromosome-3. F shows a stable aberration involving all three painted chromosomes. Break points and color junctions are indicated by arrows. Please click here to view a larger version of this figure. Figure 2: Effect of Radiation on Bone Marrow Cells of Irradiated Mouse as Detected by SKY. The upper panel shows a normal spectral karyotyping (SKY) of C57BL/6 female mouse. The middle panel shows a stable aberration involving chromosome-4 and chromosome-12. The lower panel shows mouse spectral karyotyping with a stable chromosomal aberration involving chromosome-7 and chromosome-10. Please click here to view a larger version of this figure. Several critical steps determine the success of mFISH and SKY. The first and most critical step is to optimize the colchicine treatment for in vivo mitotic arrest of the bone marrow mononuclear cells. The colchicine concentration and treatment time individually or in concert determine the mitotic index as well as chromosome condensation-two important prerequisites for effective chromosome painting. A high colchicine concentration or longer treatment time leads to highly condensed chromosomes, incompatible for proper denaturation and hybridization. Moreover, accurate identification of complex rearrangements in a metaphase cell spread with condensed chromosomes is not an easy task to achieve. Intra-peritoneal administration of 100 µL 0.05% colchicine for 2 h in a mouse with a body weight between 22 and 26 g produces an adequate number of metaphase cell spreads with moderately condensed chromosomes. The second critical step is the hypotonic treatment. The volume, treatment time, and temperature of the hypotonic solution influence chromosome morphology and spreading of chromosomes onto the glass slide. A hypotonic treatment for a shorter time period or at a sub-optimal temperature can prevent the appropriate chromosome spreading, resulting in metaphase cell spread with overlapped chromosomes. Chromosome overlapping interferes with the downstream in situ hybridization process, the specificity of fluorescent signals, and proper identification of rearrangements. Thirdly, the post-hypotonic fixation is an important step to avoid cell clump formation. The fixative should be added slowly down the side of the centrifuge tube with constant gentle shaking to obtain a single cell suspension. Otherwise, metaphase cell spreads will become trapped in the clumps and chromosome spreading will be compromised. However, chromosome spreading also depends on the cell type, temperature, and relative humidity at the time of dropping the cell suspension onto glass slides. A previous study by Spurbeck reported that for lymphocytes, a 60% relative humidity and a 20 °C temperature result in higher metaphase area18. In addition, the duration of drying is also a critical step for optimum chromosome spreading. Metaphase cell spreads that dry too quickly produce tight spreads with many overlapping chromosomes, while very slow drying results in broken metaphase chromosomes18. However, Deng showed that chromosome spreading primarily depends on relative humidity for a variety of cultured cells19. The fourth important step is to optimize chromosome denaturation time. A longer and shorter denaturation time adversely affect probe hybridization. Longer denaturation causes "puffy" chromosomes, while shorter denaturation impedes interaction of probe to the chromosomes. Another way to reduce chromosome "puffiness" is to age slides overnight at room temperature before denaturation step. Slides not used for chromosome painting immediately, can be stored indefinitely in a desiccator at -20 ºC. Chromosome denaturation time needs to be standardized with the slide age, the amount of cytoplasm around the metaphase cell spreads, and the humidity at which cells were dropped onto the slides. Probe denaturation and hybridization is also important for successful chromosome painting. Direct exposure of probes to bright light should be avoided, so that fluorescent signal does not lose signal intensity. It is well-established that mFISH and SKY are powerful techniques for detecting inter-chromosomal stable aberrations. Any rearrangements as well as loss or gain of painted chromosomes can easily be identified by these two methods. However, detection of intra-arm and inter-arm chromosomal exchanges are not possible by these techniques. Identification of intra-arm and inter-arm chromosomal exchanges have now become possible because of the development of, respectively, chromosome arm-specific multicolor FISH probes and mBAND FISH probes. A previous study on former nuclear workers has shown that mBAND analysis is a powerful tool to identify unique signatures of radiation damage20. Moreover, identification of sister chromatid exchange, a characteristic feature of radiation damage21, is not possible by these techniques. In addition, both mFISH and SKY have limited ability to paint the centromeric region of chromosomes, which may result in erroneous scoring of the dicentric chromosome as translocation. The techniques are also not suitable for identifying the exact breakpoint localization of translocation. Additionally, fluorescent signals cannot be preserved permanently, signal intensity decreases with time, and fluorescent chromosome painting is not suitable for analysis by an automated system. However, fluorescent signal intensity can be preserved for a longer period of time by storing slides in the freezer. Two improved methods of chromosome painting have been developed to overcome the limitations of mFISH and SKY: respectively, non-fluorescent chromosome painting22 and spectral color banding (SCAN)23. The advantages of non-fluorescent chromosome painting using the peroxidase/diaminobenzidine (DAB) over FISH painting include accurate identification of the centromeric region, identification of chromosomal rearrangement by bright-field microscope, and that non-fluorescent signal is permanently preserved and image analysis can be automated. On the other hand, the SCAN is advantageous over SKY because SCAN probes are prepared from band-specific genomic DNA sequences for a specific chromosome and thus, can accurately identify the origin of a chromosome-band. SCAN also facilitates the identification of intra-chromosomal exchanges. Considering the benefits of the improved techniques, these should be considered for routine use in clinical cytogenetic testing. However, preparation of probes from the band-specific genomic DNA sequence for each chromosome pairs is technically challenging and limits its use in molecular cytogenetics. Determining whether the difference among treatment groups is statistically significant or not is another important aspect of molecular cytogenetics. Scoring criteria, such as number of metaphase cell spreads counted, number of animals used per treatment group, chromosome count per metaphase cell spread during analysis, nomenclature used to classify aberrations observed after chromosome painting, etc. play a critical role in determining the statistical uncertainty between treatment groups. Although various laboratories have proprietary scoring criteria, scoring of 100 to 300 and 20 metaphase cell spreads with 40 well-separated chromosomes in at least 3 to 5 mice is generally recommended for determining statistical significance in mFISH and SKY analysis, respectively 24, 25. Moreover, the choice of nomenclature used to classify aberrations in painted chromosomes is an important parameter for assessing statistically uncertainty. There are two popular nomenclature systems in use to describe aberrations detected by whole chromosome painting probes: (1) S&S classification method by Savage and Simpson26, 27 and (2) PAINT nomenclature by Tucker et al.28. Each system relies on different prerequisites for classification of structural chromosomal aberrations and has its own advantages and disadvantages. The S&S system is primarily suitable for mechanistic interpretation of aberration origin, while PAINT provides a description of abnormal painting patterns. Studies by Knehr et al. on radiation-induced chromosomal aberrations in FISH painted chromosomes indicate that the PAINT method, like the S&S system, can also be used to determine aberration origin with some modification in the scoring criteria and would be most useful for practical application29. Both mFISH and SKY methods have their own limitations. For example, mFISH permits rapid scoring with little training, however, it does not screen all the chromosomes for measuring aberration frequency and reveals only partial aberration frequency, depending on the number of painted chromosomes used in the study. However, a fraction of total exchanges observed by whole chromosome painting can be estimated by the formula originally postulated by Lucas et al.30 and further modified by Braselmann et al.31. This mathematical formula considers exchange among painted chromosomes and between painted and counterstained chromosomes. For example, let fp represent the fractional sum of the genome covered by the painted chromosomes 1 (f1), 2 (f2), and 3 (f3), where f1 = 0.0696, f2 = 0.0649, and f3 = 0.0570, the values represent the genomic content of individual chromosomes in female mice. Therefore, fp = (f1 + f2 + f3) = 0.192 and counterstained fraction becomes (1 - fp) = 0.808. The frequency of exchanges involving painted and counterstained chromosomes (FP) can easily be calculated by the cross product of the binomial expansion (p + q)2 = p2 + 2pq + q2, where p = fp and q = (1 - fp). Thus, FP = 2pq = 2fp (1 - fp) = 0.310, which means 31% of chromosomal exchanges are observable after painting mouse chromosome-1, -2, and -3. Therefore, 1/0.31 = 3.23 cells need to be scored to equal one banded metaphase cells or one whole genome equivalent. Moreover, both mFISH and SKY have limited ability to specifically identify which genes and breakpoints are involved in the aberration formation and also to detect small duplications, inversions, and deletions. The application of mFISH and SKY analysis is not limited to basic research. Both are regularly being used in clinical studies. These techniques have also been applied to prenatal and postnatal diagnosis, risk assessment, and identification of various types of cancer. Moreover, both the techniques can be used to paint interphase chromosomes. Sokolova used mFISH to paint interphase chromosomes for the first time32. These techniques are also used for post-irradiation dose estimation and risk assessment in humans after accidental or intentional exposure to ionizing radiation11, 33. Therefore, partial or whole genome analysis by mFISH or SKY, respectively, are useful tools to detect inter-chromosomal stable aberrations for various studies. This study was supported by Arkansas Space Grant Consortium and National Space Biomedical Research Institute through National Aeronautics and Space Administration, grants NNX15AK32A (RP) and RE03701 (MH-J), and P20 GM109005 (MH-J), and the US Veterans Administration (MH-J). We thank Christopher Fettes, Program Coordinator for the Department of Environmental and Occupational Health at the University of Arkansas for Medical Sciences, for editorial assistance in preparation of the manuscript. Kodama, Y., et al. Stable chromosome aberrations in atomic bomb survivors: results from 25 years of investigation. Radiat Res. 156, 337-346 (2001). Lucas, J. N. Cytogenetic signature for ionizing radiation. Int J Radiat Biol. 73, 15-20 (1998). Zaccaria, A., Barbieri, E., Mantovani, W., Tura, S. Chromosome radiation-induced aberrations in patients with Hodgkin's disease. Possible correlation with second malignancy? Boll. Ist. Sieroter. Milan. 57, 76-83 (1978). Fisher, N. L., Starr, E. D., Greene, T., Hoehn, H. Utility and limitations of chromosome banding in pre- and postnatal service cytogenetics. Am J Med Genet. 5, 285-294 (1980). Hande, M. P., et al. Complex chromosome aberrations persist in individuals many years after occupational exposure to densely ionizing radiation: an mFISH study. Genes Chromosomes. Cancer. 44, 1-9 (2005). Gall, J. G., Pardue, M. L. Formation and detection of RNA-DNA hybrid molecules in cytological preparations. Proc Natl Acad Sci U S A. 63, 378-383 (1969). Bauman, J. G., Wiegant, J., Borst, P., van, D. P. A new method for fluorescence microscopical localization of specific DNA sequences by in situ hybridization of fluorochromelabelled RNA. Exp Cell Res. 128, 485-490 (1980). Hopman, A. H., et al. Bi-color detection of two target DNAs by non-radioactive in situ hybridization. Histochemistry. 85, 1-4 (1986). Nederlof, P. M., et al. Three-color fluorescence in situ hybridization for the simultaneous detection of multiple nucleic acid sequences. Cytometry. 10, 20-27 (1989). Nederlof, P. M., et al. Multiple fluorescence in situ hybridization. Cytometry. 11, 126-131 (1990). Szeles, A., Joussineau, S., Lewensohn, R., Lagercrantz, S., Larsson, C. Evaluation of spectral karyotyping (SKY) in biodosimetry for the triage situation following gamma irradiation. Int J Radiat Biol. 82, 87-96 (2006). Camparoto, M. L., Ramalho, A. T., Natarajan, A. T., Curado, M. P., Sakamoto-Hojo, E. T. Translocation analysis by the FISH-painting method for retrospective dose reconstruction in individuals exposed to ionizing radiation 10 years after exposure. Mutat. Res. 530, 1-7 (2003). Edwards, A. A critique of 'Collaborative exercise on the use of FISH chromosome painting for retrospective biodosimetry of Mayak nuclear-industrial personnel. Int J Radiat Biol. 78, 867-871 (2002). Bauchinger, M., et al. Collaborative exercise on the use of FISH chromosome painting for retrospective biodosimetry of Mayak nuclear-industrial personnel. Int J Radiat Biol. 77, 259-267 (2001). Hieber, L., et al. Chromosomal rearrangements in post-Chernobyl papillary thyroid carcinomas: evaluation by spectral karyotyping and automated interphase FISH. J Biomed. Biotechnol. 2011, 693691 (2011). Cohen, N., et al. detection of chromosome rearrangements in two cases of tMDS with a complex karyotype. Cancer Genet Cytogenet. 138, 128-132 (2002). Pathak, R., et al. The Vitamin E Analog Gamma-Tocotrienol (GT3) Suppresses Radiation-Induced Cytogenetic Damage. Pharm Res. (2016). Spurbeck, J. L., Zinsmeister, A. R., Meyer, K. J., Jalal, S. M. Dynamics of chromosome spreading. Am J Med Genet. 61, 387-393 (1996). Deng, W., Tsao, S. W., Lucas, J. N., Leung, C. S., Cheung, A. L. A new method for improving metaphase chromosome spreading. Cytometry A. 51, 46-51 (2003). Hande, M. P., et al. Past exposure to densely ionizing radiation leaves a unique permanent signature in the genome. Am J Hum Genet. 72, 1162-1170 (2003). Tug, E., Kayhan, G., Kan, D., Guntekin, S., Ergun, M. A. The evaluation of long-term effects of ionizing radiation through measurement of current sister chromatid exchange (SCE) rates in radiology technologists, compared with previous SCE values. Mutat. Res. 757, 28-30 (2013). Kanda, R., et al. Non-fluorescent chromosome painting using the peroxidase/diaminobenzidine (DAB) reaction. Int J Radiat Biol. 73, 529-533 (1998). Kakazu, N., et al. Development of spectral colour banding in cytogenetic analysis. Lancet. 357, 529-530 (2001). Rithidech, K. N., Honikel, L., Whorton, E. B. mFISH analysis of chromosomal damage in bone marrow cells collected from CBA/CaJ mice following whole body exposure to heavy ions (56Fe ions). Radiat Environ Biophys. 46, 137-145 (2007). Abrahams, B. S., et al. Metaphase FISHing of transgenic mice recommended: FISH and SKY define BAC-mediated balanced translocation. Genesis. 36, 134-141 (2003). Savage, J. R., Simpson, P. On the scoring of FISH-"painted" chromosome-type exchange aberrations. Mutat. Res. 307, 345-353 (1994). Savage, J. R., Simpson, P. FISH "painting" patterns resulting from complex exchanges. Mutat. Res. 312, 51-60 (1994). Tucker, J. D., et al. PAINT: a proposed nomenclature for structural aberrations detected by whole chromosome painting. Mutat. Res. 347, 21-24 (1995). Knehr, S., Zitzelsberger, H., Bauchinger, M. FISH-based analysis of radiation-induced chromosomal aberrations using different nomenclature systems. Int J Radiat Biol. 73, 135-141 (1998). Lucas, J. N., et al. Rapid translocation frequency analysis in humans decades after exposure to ionizing radiation. Int J Radiat Biol. 62, 53-63 (1992). Braselmann, H., et al. SKY and FISH analysis of radiation-induced chromosome aberrations: a comparison of whole and partial genome analysis. Mutat. Res. 578, 124-133 (2005). Sokolova, I. A., et al. 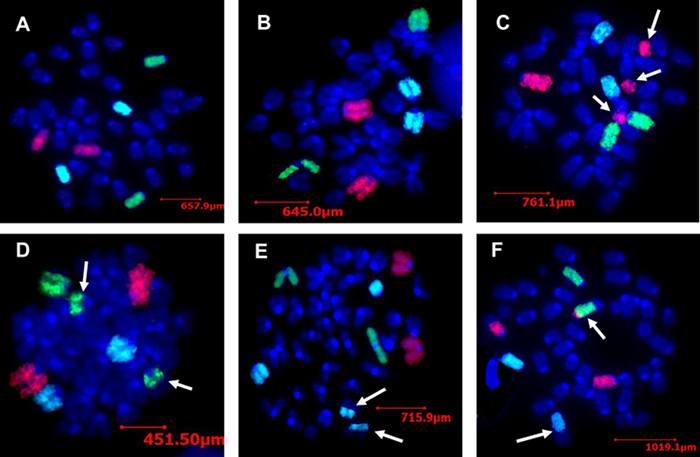 The development of a multitarget, multicolor fluorescence in situ hybridization assay for the detection of urothelial carcinoma in urine. J Mol Diagn. 2, 116-123 (2000). Lindholm, C., et al. Biodosimetry after accidental radiation exposure by conventional chromosome analysis and FISH. Int J Radiat Biol. 70, 647-656 (1996).